San Pedro de Atacama is a town in Northern Chile. It is a very popular destination among Chilean tourists and international visitors. Visitors come in large numbers, to use the town as a stepping stone to the amazing landscapes around it. 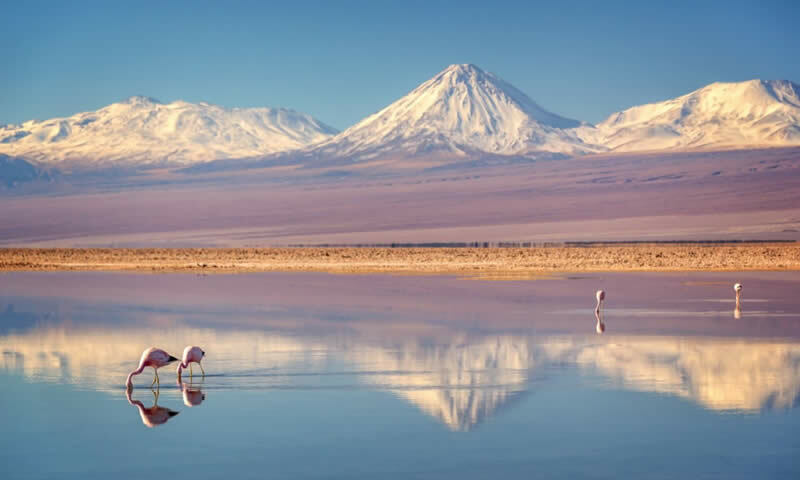 Most attractions are part of the Los Flamencos National Reserve, perhaps Chile’s most varied and amazing national park. Prices in any of the laid back bars and restaurants fare well against Santiago’s (Chile’s Capital). Still, it’s a fairly expensive location, as it’s one of Chile’s three most popular destinations, along Torres del Paine and Easter Island. Once you are in the town, nearly all points of interest, restaurants, services, are within walking distance, with the exception of a few outlying hotels. The downtown consists out of twelve small blocks, between the streets Domingo Atienza and Toconao from west to east, and Licancabur and Caracoles north to south. Caracoles is the main one, it is a pedestrian zone. Be aware that, since mid-2010, it’s now forbidden to ride a bike on it. If you look gringo enough, chances are the cops will let you slide-but it’s advised not to try. They’re fond of ticketing cyclists in the evening. If you can’t find what you need in the aforementioned twelve blocks, chances are you won’t get it anywhere. Bike rentals are ubiquitous, and prices vary little. It can pay to rent one to visit the Pukara de Quitor, Aldea de Tulor, Valle de la Luna, and even Laguna Cejar. All of these are described in the next chapter. Located at 4,200m above sea level, and 100km away from the town, these are some of the highest geysers in the world. It’s also the third-largest geyser site on Earth, with over 80 active ones. Most agencies travel there at 4 AM so they will arrive at sunrise. The spectacle is hard to forget-even if the geysers themselves are smallish, the backdrop, lighting, and sheer variety are astounding. Usually, you get to see them from the first stages of dawn, an hour before the sun rises, until sunlight bathes them completely. The best time to take pictures is at exact sunrise, but other lightings can also create wonderful pictures. All respectable tour agencies include breakfast for their guests. If you book one that doesn’t, then you’ve been scammed. If you have rented a car, alternately it may be better to visit the Geysers del Tatio at sunset, when you will have the entire place to yourself for quiet contemplation. On the way back, it’s typical to find wild vicuñas, an endangered andean camelid that’s highly protected in Chile. They were rescued from the verge of extinction thirty years ago. Vicuñas in the area are accustomed to human presence, and will tolerate tourists coming to some twenty meters away-any more, and they’re likely to flee. Be extremely respectful of the regulations, for many guides and drivers might even react in an aggressive manner if you bother the animals in any way. A common stop is the fording of the Putana river, a spectacle that for some even surpasses the geysers themselves. Many different bird species inhabit it, and it’s perfectly possible to get very close to them-giant coots (fulica gigantea) are especially indolent. Winter has the most birds, with over ten different species cohabiting the place at peak migration, but temperatures are harsh. There’s also the possibility of seeing a vizcacha or two (lagidium viscacia), a funny mix between a bunny, a squirrel, and a kangaroo. They’re very shy, though, and if you don’t get there among the first visitors, they’ll have usually disappeared. In the background, to the east, lies the Putana volcano-an active mountain that boasts seven small fumes. Lastly, there’s usually the choice of visiting one of two locations. The first one is Machuca, an abandoned altiplanic village that lived from the mining of sulpher. Most regular tours stop here. Nowadays, you’ll find a few locals there, roasting anticuchos made of llama meat. Teas, soft drinks and empanadas are also available. The meat is of questionable origins, with some wild theories as to its origin floating around. Temperatures can be terribly cold: -15ºC is common through June to August, while in summer it rarely dips below -5ºC. It’s paramount to wear gloves, a cap, and preferably two layers of socks, along with a very warm jacket. After sunrise, the cold quickly subsides, and it gets bearable. Once you get to Machuca, the heat can be stifling. Prepare accordingly. The altitude, coupled to a steep and winding road, can easily cause altitude sickness. Almost all agencies claim to carry an oxygen bottle on board; this is false. They do bring a can with air compressed to one atmosphere, but it does little other than acting as a placebo. See the section ‘Cope’ for advice on preventing and ameliorating the sickness. Renting a car is possible, either in San Pedro itself (~ 75000 CLP for pickup car), or in Calama. The road was entirely paved at some point in the distant past, but now it is in mostly poor condition, especially from Machuca to the end. Infrastructure improvements are underway to make this route more easily accessible, but as of 2016 it is fine on a 2 WD vehicle, it will just be a bit bumpy.